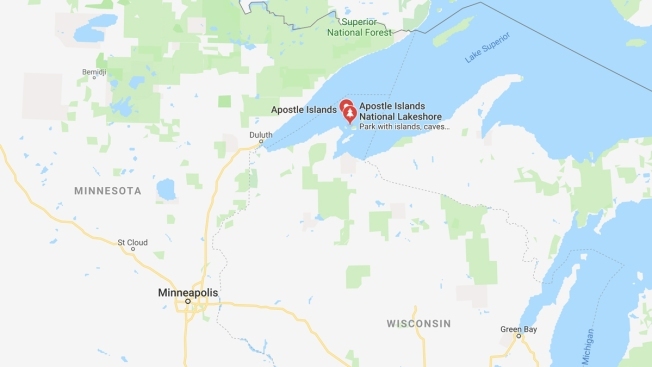 Wisconsin's Apostle Islands, where a man and his three children died in a kayaking accident Thursday, Aug. 30, 2018. A kayak carrying a family of five flipped in Lake Superior off northeast Wisconsin last week, killing the three kids and their father while their mother managed to survive several hours in the water, NBC News reported. Cari Mews, Erik Fryman and their kids, ages 3, 6 and 9, were on vacation, touring a series of islands known for their caves and cliffs off the northern tip of Wisconsin Thursday when their kayak capsized, according to NBC affiliate KBJR. Mews' sister eventually received cryptic text messages, including "911," but they didn't immediately go through due to poor cell phone reception. She called authorities when she got the messages hours later. Rescue crews found Mews alive after she'd been in the water for about six hours, but the bodies of two of her children and her husband were found soon afterward.